Product #1285 | SKU 1052BAC | 0.0 (no ratings yet) Thanks for your rating! 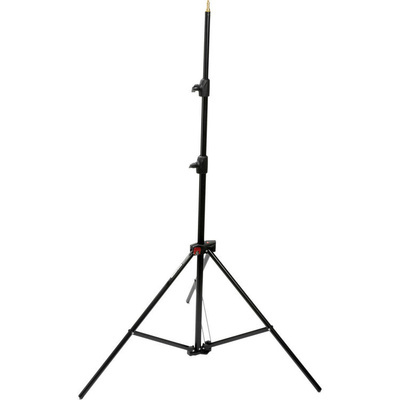 The Manfrotto 1052BAC Compact Stand rises to a maximum height of 2.3 m, and is air cushioned. Formerly known as a "Stacker", this stand now has what is called the QSS - Quick Stand System. When folded, two or more of these stands may connected to each other to ease storage or transport. Air cushioning protects fingers and mounted equipment. If the stand sections are not sufficiently tightened, mounted equipment eases down to minimum height instead of slamming down suddenly. This package includes a top baby (5/8") spigot is topped with a 3/8" thread, that thread is topped by a removable 1/4-20" thread.